Local residents share stories about how they became interested in living more sustainably. Raja is a climate consultant working around the world, Anna is a producer initiating arts and bio-medical projects within the NHS, Ali is championing eco awareness in schools, and Rose is passionate about local food. Then we can all have a conversation! There is also a rare chance to see short entertaining films, including Forkbeard Fantasy’s‘Carbon Weevils’, and Arts Admin’s ‘Pandemonium’ which was part of Imagine the Great Transition. And you can have a go at ‘Artspark’s specially-created board game.. We’ve been asking people how they think climate change could affect them and their town and used their ideas to create the game…but we want to know what you think too! The Bar will be open and there will be some yummy locally-sourced snacks too– made by Bridport-based Rude foods. North Dorset District Council will be holding a special North Dorset Development Control (Planning) Meeting on the 17th March to make a decision about the proposed Wind Farm Devpt at Blandford Hill, near Winterbourne Whitechurch. 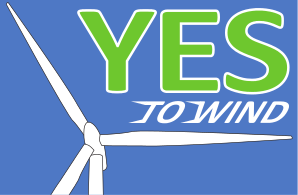 Now is the time though to contact District Councillors to show them there is support for this renewable energy development. 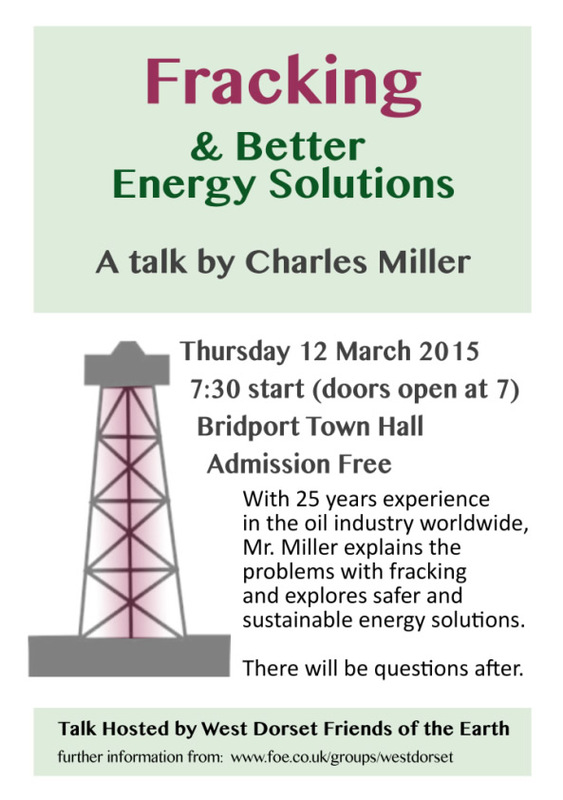 West Dorset Friends of the Earth group are delighted to invite you to this interesting and informative talk regarding fracking, presented by Charles Miller. With twenty-five years experience in the oil industry worldwide, Charles Miller gives a brief outline of the Energy Crisis. He will then explains the problems with Fracking and safer and sustainable Energy solutions that other countries are choosing instead of Fracking, to protect their citizens and countryside and to keep energy bills from rising. There will be time for your questions at the end of the talk. There are many ways and techniques used to save energy so we can make our bills significantly lower, including reducing our carbon footprint and more. But it takes some knowledge and work to pull it off successfully. The following tips will give you the necessary knowledge so you can help cleaning the pollution by improving your overall energy efficiency. They have been around for pretty much over a hundred years, but they are slowly losing ground to other, more efficient solutions out there and what they have to offer. For the most part they tend to do their job; however their energy efficiency is quickly becoming obsolete, due to converting much of their power into heat instead of simple light. If you want to take your green energy efficiency up a notch, then you will need to remove them and replace them with something more efficient, such as LED, fluorescent or halogen lights. They will both have a longer life and better energy consumption rate than the pioneers of electric light. If you feel a draft around your home, then this means you likely have a breach in your walls or ceiling that allows air to escape into the outside world. Poor insulation around most home is one of the chief reasons why you may be battling a higher energy bill. If you want to get the bills down, then you will need to insulate all areas the best way you can. You can identify these by hiring a professional to do a thermographic inspection of your home, noting problem areas and tackling them later. Plus sealing the leaks will prevent the dirt coming to your home and will make your house cleaning easier. If you have ever heard the term vampire energy, then you are likely aware this has nothing to do with fictional beings, but it concerns the small draw all appliances have, constantly sucking energy off the grid even when they’re in standby mode. Get into the habit of unplugging your TV, electronics and anything else that doesn’t really need to be plugged in to function right. Energy conservation habits like this will improve your power consumption in the long run. In addition, cleaning your appliances regularly will make them more efficient. If you have poor insulation, then you will experience a lot of heat loss through your windows, so you would do well to replace them with something that works better and stops the heat loss. There are many ways you can do this, but thankfully there are plenty of companies that work with this type of window solutions out there. UV-filtered glass is also an excellent addition to the windows, as they will keep the most harmful of the sun’s rays out of your home, sparing your furniture and personal belongings from harm. However, you will need to be extra careful when cleaning your windows, because this type of glass is more vulnerable to scratches. You can hire a professional cleaning company to avoid any damages. The better windows also have a gas insulation inside that prevents heat loss with a significantly better success than the usual, old-fashioned windows used in the past. You will likely need the help of an experienced handyman to get something like this done, as well as any other projects such as appliance repair, electrical services, home repairs and other odd-jobs that need doing, so consider looking for one. This post is by Guest Energizer Sofia Lewis for Cleaning Domestic Cleaners Ltd. who offer eco-friendly cleaning services. She is a passionate freelance article writer and blogger. She is inspired by home improvement projects and writes mainly about cleaning, green living home solutions, removals and other home related topics. "These are brilliant energy conservation tips! Good job putting these together. We will share this through our social media channels for you. " "Brilliant basic tips guys- I actually think the simplest things i.e. switching off a light when you leave a room, turning everything off as opposed to leaving it on standby and so on can make a huge difference but a lot of homeowners consider this and switching to energy efficient bulbs as a pointless move- it’s a shame that more don’t understand how the smallest changes can have the biggest impact "
Communities Living Sustainably in Dorset are holding an event in South Street, Dorchester. There’s more info on the CLS website – and a chance to take part in a competition and to post your own photos. I was reading recently that a senior American politician from the Climate sceptic camp seriously suggested that anthropogenic Climate Change couldn’t possibly exist because God wouldn’t permit anything as trivial as human GHG emissions to interfere with His world http://www.slate.com/articles/health_and_science/climate_desk/2013/12/creationists_and_climate_change_political_union_of_science_critics.html . I understand that there is a real debate especially within the Evangelical Christian movement as to whether we live in an age of miracles or whether miracles are just a feature of biblical times. I recently asked pretty seriously whether Eric Pickles, an Evangelical Christian, was expecting a miracle to solve the Climate Change problem given his attitude to wind farm planning applications. My attitude to miracles is that He could have moved the bird! What do I mean? Well let’s take a fictional but typical example of a “miracle”. A plane is taking off from an international airport with 150 people on board. It strikes a bird and, because it is so close to the ground, the resulting damage is enough to cause the plane to crash before the pilot can react. 149 people die horribly in the flaming wreckage but one small baby is thrown clear and survives albeit as an orphan with nasty burns. The baby comes from one particular faith group who hail this as a miracle (“Praise the Lord!”) If challenged they say something like “What were the chances of the baby surviving it must be a miracle!” Arguing over the probabilities isn’t my objection to the notion of this sort of event as a miracle. I reject this sort of thing as a miracle because God could have just moved the bird 100m to the right or left so that the accident didn’t happen at all and no negative outcome would have resulted except one slightly disorientated bird who would quickly work out where he was and carry on with his life as before. It seems to me that there are only two possible explanations for this. The first is that it was no miracle. It was just that when you live in a world so surrounded by bad stuff, then eventually, however unlikely, a few good things come along. The second is that God is so obnoxious that, when faced with the choice of two miracles involving very similar tweaks to the laws of physics, one that will save one life and one that will save 151 lives, He will pick option A because option B doesn’t give Him the same publicity. Some may think this is either a silly point or one disrespectful of God and/or peoples’ faith but remember we are talking about the politics of the American religious right who are simultaneously driving both the climate change denial agenda and such things as the campaigns to force schools to teach creationism alongside or even instead of evolution. They are driving those agendas remarkably successfully. When we consider the possible outcomes of climate change some of the worst case scenarios seem too terrible to contemplate even if we don’t believe that God would step in to help us. We say “What are the chances of catastrophic anthropogenic Global Warming? Surly that isn’t likely.” By the way you know that you are reaching the last bastion of climate change denial when the sceptic starts talking not about “Global Warming” or “Anthropogenic Global Warming” but about “Catastrophic, Anthropogenic Global Warming” or CAGW. It is true that we cannot be certain when or if CAGW will kick in due to tipping points and the range of possible sensitivities of the system to CO2 concentration, but we can be certain that there is a probability that it will occur, that that probability is significant and that it is far higher than the probability that no further Anthropogenic Global Warming will occur if we continue with business as usual. I suggest that, with due respect, if God was going to get us out of this fix he would have done so quietly and subtly long before now and we wouldn’t be having this debate. We need to act now not waste time arguing about the exact probabilities! Why did we get an electric vehicle (EV)? By coupling our EV to a few solar panels we have decoupled ourselves from the corner gasoline station and from the gas fired power plant that provides electricity to the Monterey Bay area. Since we were going to buy a new car the decision to go EV translates to a much smaller carbon footprint for our household. We also wanted to press for change at the societal level and supporting the budding EV industry seemed like a good way to achieve that goal. Nissan’s Leaf is an excellent EV and hybrid’s are certainly a step in the right direction. But neither of them caught the public’s attention the way Tesla has with the Model S. It’s been just three years since the Model S came on the market and major auto builders around the world have been forced to respond with EV’s of their own. Porsche, Kia, Volkswagen, Fiat, Mitsubishi, Diamler, Honda, BMW, Ford, Toyota, GM, Nissan as well as new auto companies either have entered the EV market or are just about to do so. The first company to offer a 200 mile per charge car for under $40K US will sell a lot of cars. Not many years ago Toyota came out with the Prius. Nay sayers scoffed but now every manufacturer has a line of hybrid vehicles. The Nay sayers are at it again but the industry seems to be saying that EV’s are here to stay. Battery technology will advance and so will solar power technology. As these technologies advance the prices will fall and sales will rise. "I second all of Roger’s reasons. Next month it will have been a year since I visited a gas station – don’t miss it a bit. Yes, the regenerative braking is great. It’s amazing how little I use the brake pedal. I’m due to bring Mr. T in for a yearly check up in late March. The service folks will probably refill the windshield washer fluid for me. And by the way, having Mr. T’s abilities upgraded from time to time while I sleep is very nice. " "Roger what colour is yours and where do you charge it ? " "as a leaf owner I can only echo the story that ev is here to stay and will grow hugely as all the technologies improve. By the way in the UK we have gone in 18 months from 500 to over 5000 charging points to make the ELECTRIC HIGHWAY a reality. " "Hi John, beyond the reasons you mentioned I also bought the Tesla Model S for a few others. My 5 KWH photovoltaic system provides lots of power etc. But it is an awesome car. It looks great, drives well, and just puts a smile on your face as you pass by the gas stations. I have just under 8,000 miles and had no scheduled services since there isn’t anything specifically to service on an EV on a regular basis. I doubt I will ever have to replace the brakes because of the regenerative braking system, but I may have to add windshield wiper fluid and have to change the tires a few years down the road. So besides doing it for all the “right” reasons you can still have a very safe automobile that is very fun to drive. " Another record month for wind but one with a couple of holes in it. The real achievement of wind power in supplying a new record share of our electrical energy needs in January was of course played down by opponents of renewables pointing to intermittency in the output. If you look at the monthly data from the Grid http://www.gridwatch.templar.co.uk/ you do indeed see a couple of days (c. 19th and 21st Jan) that were especially quiet and a couple more that weren’t great. However the striking thing about the graph is actually how steady at between 3 and 5 GW the wind output was for at least 20 of the days in January. If you now look at the data for the other technologies you will see that the slack at the low wind output times was taken up by CCGT or Combined Cycle Gas Turbine generation. This isn’t the inefficient Open Cycle Gas Turbines as is sometimes claimed by those that try to suggest that wind turbines don’t save carbon emissions as these days OCGT are used very rarely and then mostly to deal with the massive spikes in the demand curve or massive fall outs caused by a big failures in centralised coal or nuclear generation or grid problems. Modern CCGT generators are much more flexible than older kit and can deal with pretty much anything the intermittency of wind will throw at them. So the next issue is whether CCGT necessarily means fossil fuel natural gas. Well no. If we were ever to be lucky enough to get to the point where our wind and other renewables capacity was so high that we had to curtail output because there wasn’t the immediate demand to use the power we could use surplus renewable energy to produce hydrogen and synthetic gaseous fuels. These could be mixed with the normal gas in the gas main to a percentage of in excess of 10% (which I understand would be the maximum percentage for pure hydrogen addition before there were technical issues with burners and other infrastructure). Furthermore stand-alone combinations of wind, solar, hydrogen, syngas and AD/biomass sourced gas feeding to some storage capacity and CCGT dispatchable generation could very conceivably be designed to cope with a much wider range of gas compositions making the use of pure natural gas a thing only of the most urgent crisis in supply. Currently we are earmarking massive capital investment in Hinkley Point and look set to repeat this several times over in new generation nuclear reactors. If this sort of capital is available it could be being spent on a small number of massive pumped storage facilities on the scale of Dinorwig and a more significant number of small plants such as Glyn Rhonwy http://www.renewableenergyworld.com/rea/news/article/2013/09/the-time-is-right-for-small-pumped-storage-in-the-uk-developer-says . We do not need to wait for yet to be developed battery storage or smart grid solutions (which do seem set to materialise pretty soon nonetheless) to be increasing our ability to tackle intermittency with storage. Next is the assumption that Renewables means wind. Wind has to be a major player in any current significant renewable portfolio but, by mixing in a number of smaller players we both increase capacity and reduce overall intermittency. Solar, hydro (not pumped storage), wave and tidal are either already available to deploy in larger amounts or are requiring only limited further development to make them economically viable. Such technological diversity reduces the chances of total renewables unavailability to practically zero even without storage solutions and certainly will reduce the periods of very limited supply to such short timescales that our technological fixes can cope with it. Finally there is the question of what we have to do to make using fossil fuels OK to plug the gaps. Although fossil fuels are finite and will run out eventually it is clear that the pressing issue is Green House Gas Emissions so the answer is simple ie Carbon Capture and Storage http://www.ccsassociation.org/what-is-ccs/ . This has been talked about for generations now (ie more than 25 years) but development has been painfully slow because there has been no incentive on those making big money from fossil fuels to invest in it. If those people are made to see that they have to compete with renewables not only in terms of immediate financial cost but also on environmental standards I am pretty confident that they can make it work albeit at a cost and perhaps with limits on the rate of usage of fossil fuels to keep pace with the rate at which we can stuff the CO2 underground or elsewhere. This is fine if fossil fuels are part of a varied portfolio of energy sources including large amounts of renewables instead of being the monster supplier they are now. Finally finally I must stress that although all these solutions to the intermittency problem are to some degree in the future so is the problem itself except in the minds of the renewables opponents. The variation in demand produced by us all wanting to drink tea during the same commercial break in our favourite soap or the fact that it is cold in winter and warm in summer means that the system will have to cope with intermittent demand whatever our generation strategy and even with a new record being set for wind generation for Jan 2015 we can add plenty more renewables capacity before a calm day will put the lights out! "A NY Times article of Nov., 2014 points out that at that time wind and solar were cost competitive with fossil fuels in the US. http://www.nytimes.com/2014/11/24/business/energy-environment/solar-and-wind-energy-start-to-win-on-price-vs-conventional-fuels.html These cost estimates don’t take into consideration the world wide damage done by the extraction, transportation and burning of fossil fuels. The US Academy of Sciences put the cost fossil fuels added to America’s health care alone at $120 billion a year and that doesn’t count the cost of global warming, other untraceable pollution and damage to other parts of the world while extracting and transporting fossil fuels. Fossil fuel companies are currently not held accountable for these hidden costs of the energy they supply. If customers did have to pay those costs or if those costs were deducted from the profits of stockholders and employees renewable energy would seem cheap. " CONGRATULATIONS TO DAWN CANNING who has just been picked as our latest winner! Dawn can enjoy 4 copies of STIR delivered in print, straight to her door, for FREE! Stir To Action presents a six-month programme of training workshops in Bridport, Dorset to build the co-operative capacity of local communities. These workshops introduce participants to new tools, innovative strategies and the practices that can enable us to face up to climate change, financial crises and the other social problems we currently experience. Renewable energy co-operatives have taken off in the UK over the last few years as people work together to take power generation back into their own hands. 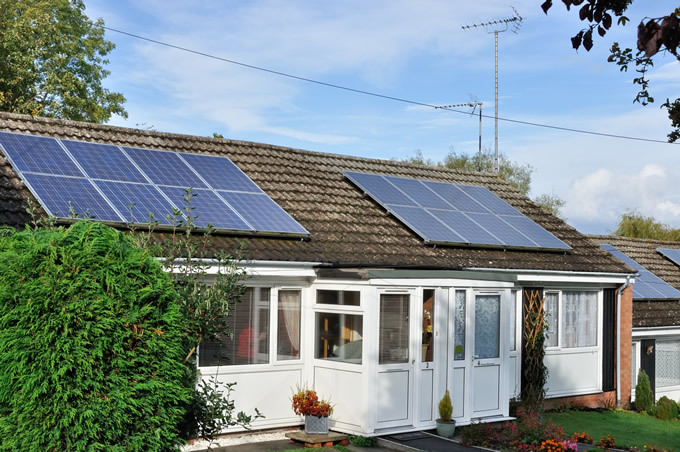 Sharenergy is a co-operative helping people around the UK set up renewable energy projects funded by community share offers – from solar roofs to £1m wind turbines, from community heating to hydro projects. In these workshops, facilitated by Jon Hallé, you’ll learn all about the renewable energy technologies and what it takes to make them happen. Bring your ideas, learn from what is working elsewhere, and take the next big steps to getting power to the people set up in your area. Jon Hallé has been working with renewable energy co-ops since 2003 and has been involved with many successful new models (and some instructive failures). He is a cofounder (with Eithne George) of Sharenergy, which has supported over 100 community renewable energy projects, including the UK’s first heat co-op, Scotland’s first 100% co-op owned wind turbine, and plenty of other interesting projects across the technologies and scales. Before that he was a programmer, waste oil biodiesel maker and environmental activist. Lunch is included sourced from local co-operative food producers and members of the Landworkers Alliance, and it will all be cooked in a Wonderbag non-electric slow cooker. This workshop place is worth £75 and we hope will inspire our lucky winner to take some of these alternatives back to your own community or organisation! The competition ends at midnight UK time on 28th February 2015 and the lucky winner will be picked at random from all our e-newsletter subscribers on 2nd March. Simply sign up to our e-newsletter, if you haven’t already, for the chance to win!